This Sunday, Jan. 26, the National Academy of Recording Arts & Sciences (also known as The Recording Academy) will host its 56th annual Grammy Awards presentation. Awards will be given in 82 categories covering 30 fields of music  including Record of the Year, Album of the Year, Song of the Year and Best New Artist. But out of all the music that is released each year, how does the Recording Academy winnow it down to 82 winners? Lisa Goich, a project manager at the Recording Academy offices in Santa Monica, Calif., shed some light on it. "It's a really good process," she says, "and I think it just ensures what gets to the top is truly exemplary." 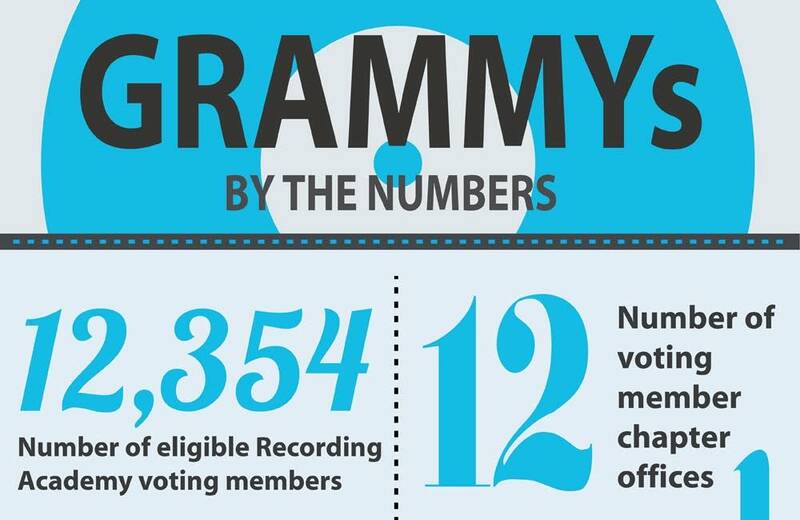 The Recording Academy comprises 12,354 voting members. To qualify as a voting member of the Recording Academy, one must be able to prove a career in music through documented evidence; basically, this means you must have at least 12 recorded tracks that have been commercially released in the U.S. through industry-recognized outlets. Each prospective member is subjected to a thorough vetting process. That said, when a person is accepted into the Recording Academy, he or she is essentially a member for life. "Once you're a member," Goich says, "as long as you continue to pay your dues and keep your membership paid and active, you can continue to participate." Members are organized under 12 chapter offices, determined by geography. Because Chicago is the nearest chapter office to Minnesota, any Minnesota-based members of the Recording Academy report up through the Chicago chapter. Recorded works are nominated by the voting members. To be eligible for this year's Grammy Awards, works had to have been released between Oct. 1, 2012, and Sept. 30, 2013. They also had to have been recorded within the past five years  in other words, a 25-year-old record that was reissued in 2013 would not qualify for Grammy consideration. This year, a total of 22,000 eligible works were nominated. When all of the year's 22,000 nominations were in, Goich and her Recording Academy colleagues bivouacked themselves in a hotel for three days to listen to every single nomination in their respective genres. Each nomination is checked for its eligibility and to ensure it has been nominated in the right category. This year, Goich listened to more than 1,000 entries in her genres. It's an intensive few days. "There are CDs going from room to room to room to room to room," Goich says. "You can get up and take a walk, go get some sunshine on your face, but really it's just listening, listening, listening." Sometimes the evaluation can be rather hair-splitting. An album nominated in an instrumental category, for example, must contain at least 51 percent instrumental (i.e. non-vocal) music. "We've ended up so close in some categories that we have to time each track to determine which category it will eventually fall into," Goich says with a laugh. "That's why it's the Academy of Recording Arts and Sciences!" Once all entries have been classified properly, the first ballot is sent to all 12,354 voting members. The ballot consists of 30 fields (genres) and further subdivided into 82 sub-fields or categories; for example, Classical is a field, Orchestral Performance is a category within that field. Goich explains that members can choose up to 20 categories to vote in, plus all members are eligible to vote in the four general categories: Record of the Year, Song of the Year, Album of the Year and Best New Artist. "We urge the voters to select the categories that they know the best and that they think they're best qualified to judge," Goich says. "I think people really do that anyway  you gravitate to the thing you know best." There's another strict criterion that all voting members must observe. "We urge them to judge recordings by quality alone, uninfluenced by personal friendships, company loyalties, sales numbers, regional preferences," Goich insists. "We encourage people not to vote based simply on airplay or what was the highest-selling album. You should base it on quality alone." Once the member votes are in, each category is narrowed to five candidates. In several categories, the closest it gets is a top 15. That is when national review committee meetings are called. At a national review committee meeting, the top 15 vote-getters in a category are assembled by the accounting firm; nobody knows which work received the most or least votes from among those 15. A three-day meeting is held to evaluate the 15 tracks in question. "They're confidential meetings," Goich says. "We never give out names of who's on the committees, but they are the best of the best in their field." Out of the national review committee meetings, the 15 are narrowed to a top 5. Once all categories are finalized, the second ballot is assembled. The second ballot is distributed to all 12,354 voting members  and the results of that second vote is what we'll all find out on Sunday, Jan. 26. Additional thanks to Recording Academy member Andrew D. Huber and to Chicago Chapter Membership Coordinator Maurice Kalous for their assistance.